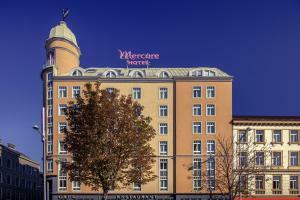 Mercure Wien Westbahnhof offers a central location close to the popular shopping street Mariahilfer Straße, and the Wiener Stadthalle (event and concert location). It offers free wired internet access in the entire building. The U3 underground line takes you directly to the city centre in just a few minutes. Vienna’s Western Train Station (Westbahnhof) is directly adjacent, and the shuttle bus to the airport stops in front of the hotel. The Mercure Wien Westbahnhof features a large lobby, a bar offering cocktails and wines, and a sauna. The on-site restaurant M fifteen serves regional cuisine as well as modernly interpreted Austrian specialities.